As I wrote in an earlier article, CAC populations have created a new category of rarity: the appearance rarity, which is most akin to traditional condition rarity. A scan of the most recent CAC populations reveals a number of coins which are very surprising to me as appearance rarities. In some series, such as three-dollar gold pieces, conclusions which I reached years ago have been proven accurate; in other series, I was surprised to see how scarce certain coins were by CAC approval. Let’s look at the various denominations of Liberty Head. I was moderately surprised at the relative difficulty in finding CAC approved examples of the 1850-C and the 1852-D. In my books I have mentioned that these were very difficult issues to locate with good eye appeal. CAC populations are skewed towards higher grades on both of these dates, which suggest that many collector grade pieces have not yet been sent to CAC. The major surprise is the 1854-D, which has a population of just two (EF45 and AU58) as of May 2015. I have handled some pretty nice examples over the years but, come to think of it, have yet to offer one with a CAC sticker. In the Type Three series, two surprising dates are the 1858-D and the 1865, both with only five approved. The 1858-D is relatively common and I have handled some really nice Uncirculated examples; nonetheless only two Circulated examples and three Uncirculateds have been approved so far. A number of Liberty Head quarter eagles have very low CAC populations. Some of these are dates which I expected but others are dates which I would have figured were much more available. Four of these are from Charlotte: the 1843-C Small Date (four approved), 1846-C (two approved), 1856-C (only one approved), and 1860-C (five approved). There is an interest trend seen in these dates: three of them (all but the 43-C Small Date) are known for being poorly produced with mint-made planchet issues. Perhaps the graders at CAC aren’t familiar with these mint-made problems and clearly this lack of eye appeal makes it hard for an example to be stickered by CAC. Five more dates are from Philadelphia and these aren’t necessarily the dates I expected to be rare per CAC approval: 1862/1 (two approved), 1867 (three approved), 1868 (five approved but all in AU58 leading me to speculate this figure is inflated), 1870 (four approved), and 1872 (six approved). Another date from Philadelphia with a very low approval rate is the 1883, with just three stickered. Given how awful most examples of this underrated date are, I’m not surprised by this figure. This series is probably the least surprising given the numbers of coins approved by CAC. The grade distribution of Three Dollars gold pieces differs from Liberty Head quarter eagles or half eagles in that these coins didn’t tend to see heavy commercial use and fewer branch mints coins were issued, meaning higher quality coins. In the Philadelphia issues, I have always maintained that the four toughest dates to find nice are the 1858, 1865, 1873 Close 3, and the 1877, and CAC approval rates verify this. The one date with a lower approval rate than I expected is the 1869 with just eight stickered; one less than the rarer 1877. Interestingly, only one Uncirculated 1869 (an MS62) has currently been approved by CAC. There are some very interesting numbers in this series. One expect the numbers to be low for a number of dates due to the fact that they are fundamentally rare and that they tend to be found in low grades. A number of Philadelphia No Motto half eagles had much lower approval rates than I would have expected. These include the 1841 (three approved), the 1849 (seven approved), the 1850 (six approved with five in AU58), the 1855 (seven approved), and 1858 (five approved). None of these dates is really rare and I have seen some really nice examples of many of them. I would have to speculate that numbers are possibly artificially low given that circulated examples are still not being sent in by many collectors/dealers due to low value. The 1858-S shows only two approved and both are in extremely low grades (Good and Very Good). I find it surprising that at least a few EF or lower end AU coins aren’t up to CAC standards. Many of the New Orleans No Motto half eagles have very low CAC populations but it is not necessarily the dates which I expected. Only three 1843-O Small Letters have been approved with none better than AU50; seemingly none of the small hoard of nice Uncirculated pieces which surfaced a decade and a half ago have been seen by CAC thus far. The 1855-O, 1856-O, and 1857-O have CAC populations of six, four and five, respectively–which are lower than the rarer 1847-O (a surprising 10 approved so far). I am not at all surprised by the low CAC approval rates of the rare 1862-1866 issues although I would have expected a few more in the VG-VF range to have been stickered. The population figures for this type tend to be higher than for the No Motto half eagles due to higher survival rates. And for some of the more common later dates we can discount low CAC numbers in circulated grades due to the fact that these issues are not yet sent to CAC. A fairly common San Francisco half eagle with low CAC numbers is the 1872-S with just four approved. I find this surprising as this date tends to come with fairly good eye appeal in EF40 to AU53 grades. The 1876 is a rare low mintage issue but there are some nice comparatively high grade pieces known. Only two examples of this date have been approved by CAC thus far with both graded AU55. The 1892-S, with just seven approved, is a surprise to me at this date is generally available in grades up to MS62/63. Among the 20th-century dates, the standout is the 1904-S with only six approved by CAC. This doesn’t totally surprise me as I have long felt that this was a scarce, undervalued coin. This is a series replete with issues with low CAC populations and this makes sense: many No Motto Liberty Head eagles are found with abraded surfaces, signs of recent cleanings, and/or below average eye appeal. Still, a few dates are surprising, even to a dealer like me who specializes in this series. The 1839 Head of 1840 and the 1844 are rare issues and I would expect them to have low CAC numbers, but one each is even lower than I would have expected. Two other Philadelphia dates which had lower CAC populations than I might have expected are the 1842 Large Date with just three (and none above AU53), and the 1851 (a date which I seemingly see with good eye appeal with some deal of regularity). The 1846/5-O is the most surprising New Orleans eagle of this type with only three approved by CAC. But as I sit and write this, it does seem that most examples of this variety are very scuffed and have below average eye appeal. Nearly all the No Motto eagles from the San Francisco mint are rare and most have very small CAC populations. The date I find most surprising is the common 1857-S with just six approved by CAC; this is a date which seems more available than this with good eye appeal. The pre-1878 Philadelphia and San Francisco issues of this type mostly have low CAC numbers and this is not a surprise given the scarcity/rarity of most of these issues. The one date which did surprise me is the 1872 with just a single example approved this far. Two moderately scarce Philadelphia issues with lower-than-expected CAC approval were the 1884 (only four have been approved which is one less than the very rare 1883-O! ), and the 1890 with eight. There are not many surprises in the Type One series. The classic rarities (1854-O and 1856-O) are represented by just one example each with CAC approval, while the Tier Two rarities (1855-O, 1859-O and 1860-O) have low CAC populations as expected. The two Philadelphia Type One issues with low CAC approval ratings are the ones I would expect: the 1859 with only seven and the 1862 with only six. There are a few surprises in the Type Two series. The 1871-CC has an expectedly low figure of just eight, but seven are these are in EF grades. The 1871 has the lowest CAC population of all the Type Two Philadelphia issues with 13 and only three are in Uncirculated. A bigger surprise is the 1873 Closed 3 with 15 approved by CAC and only three in Uncirculated. The ultra-rare business strike Type Three issues (1881, 1882, 1885, 1886, and 1891) have very low CAC populations (as expected); the 1881 and 1882 have just one each. A sleeper date is the 1892 with only 10 approved by CAC. Amongst the later dates there are few surprises, although I was a bit intrigued that the 1902-S had a lower CAC population (24) than a number of other comparable or scarcer issues. Studying recent CAC population figures is interesting. In many cases there are now enough examples of certain dates submitted that we can begin to make conclusions about appearance rarity. Some dates formerly regarded as only scarce turn about to be rare in regards to CAC approval and vice-versa. 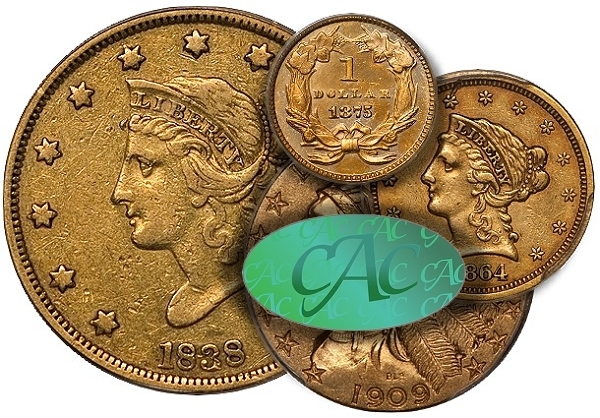 Do you collect CAC approved rare date gold coins? 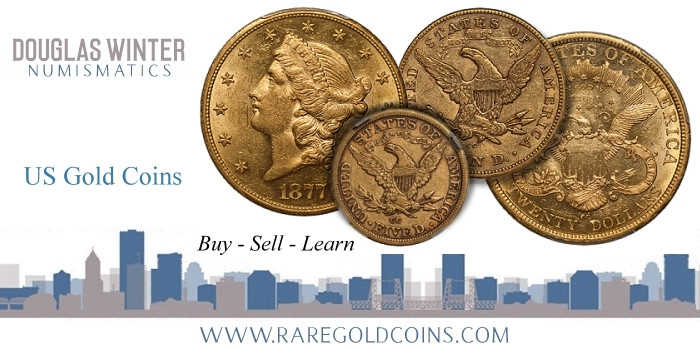 I handle many choice and rare 18th and 19th century gold coins which have been approved by CAC and you can view them on my website (www.raregoldcoins.com). 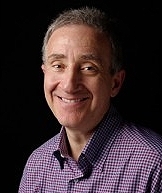 Or, you can contact me by email (dwn@ont.com) to discuss your collecting goals.